Recently, the Junior Fellowship program started offering Canadian placements at Engineers Without Borders’ national office in addition to the placements that are offered in our sub-Saharan African partner countries. Even though I had my heart set on going overseas, after much deliberation I decided it made more sense (for personal reasons) to stay in Toronto and take a placement with the Engineering Change Lab, a collaborative platform for diverse professionals transforming the engineering sector. One project I tackled during my Junior Fellowship with VOTO Mobile was the implementation of an initiative to increase the hiring of local women in our company. 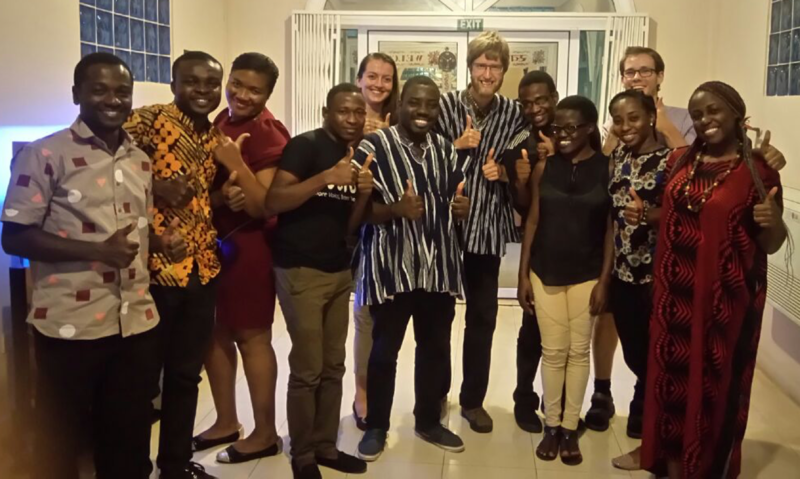 While VOTO has strong local hiring practices in Ghana, it tends to hire more men than women, particularly within its operations team. My manager and I wanted to fix that. We knew that there were great, tech-savvy, socially-innovative Ghanaian women out there, and we wanted to find them. Looking back on my Junior Fellowship with Mobile Business Clinic (MBC) Africa in Accra, Ghana, I don’t see it just as a failure. I see it as an eye-opening experience, a time in which I was given the opportunity to learn from a diverse set of people, and an opportunity to learn about and embrace my personal shortcomings. MBC Africa is an organization striving to accelerate the growth of agribusinesses in Ghana, primarily through business training and technical advisory services. When I began my placement at MBC, I met my manager – an ambitious and intelligent Ghanaian woman in her twenties. I laugh when I think back to this time because on my first day in the office, we ate jollof rice from the same plate. Picture it. There I am, long hair combed over, wearing big square-framed-glasses, foreign as can be, sitting at my manager’s desk-for-one, eating out of the same Styrofoam box as her, and so happy. I was at my best in that moment, but I went downhill from there. My specific task for MBC was to design an alumni engagement platform for the graduates of their Accelerator Program. The new platform was meant to continue to service the needs of the graduates while continually engaging and growing MBC’s network of agribusinesses. Obviously, a good relationship with my manager was important to ensure I carried out this task in a way that would be sustained by MBC but I failed to build the cohesive and comfortable working relationship required and never figured out how to show up in a way that allowed us to work toward the same goal. Upon reflection, I realize that my failure runs deep. I mistakenly failed to trust my manager’s decisions and so I challenged her on almost everything. I wasn’t willing, or able, to see her point of view and stayed entrenched in my own perspectives, and in doing so, destroyed our ability to communicate with each other. I take this as a personal shortcoming because not only did I fail to effectively communicate with my manager, but at times, I grew deeply frustrated during our conversations and let my frustration show. I am not proud of myself for this as it further poisoned our relationship. I was unable to adapt to a working relationship that was different from what I was accustomed to. From my work experiences in Toronto, particularly with EWB, I had grown used to a working style with a much larger focus on co-creation. As such, it was hard for me to accept and adopt the more hierarchical work structure of MBC, even though I knew such a structure was common and appropriate in some Ghanaian work settings. At the end of the day, I was fundamentally unable to separate my emotions from my work. Every work action I took was laden with frustration, and my hostility was harmful to our relationship and, ultimately, my motivation to do my work. The process of building trust is difficult to shortcut – it requires time. This failure has shown me the value of being open to the perspectives of others and willing to really listen to their ideas, even if they aren’t singing a tune that I resonate with. Going forward I will be flexible to different working styles and consistently communicate my work to ensure buy-in before I become too attached to my own perspectives. I also must find a healthy way to quickly and constructively deal with my emotions when I become frustrated so as not to let them harm future relationships. Haroon Dawood is currently an undergraduate chemical engineering student at the University of Toronto. Going into his fifth year of volunteering with the Engineers Without Borders chapter at U of T, he is currently serving as one of the chapter’s Presidents. In his spare time, Haroon loves to play basketball and hang out with his friends.